Leaving your RV exposed to the rain and snow during the winter can lead to roof damage and leaks. So what's the best way to protect your RV and prevent leaks during the winter? If you store your RV outside during the winter, I recommend investing in a good RV cover. I've used one for many years. Simply keeping the cover on during the winter is the best way to extend the life of your RV. Plus, if you've ever had to clean your roof in the spring, then you know how nasty your roof can get after just few months of winter weather. Large RV covers can be very frustrating to work with. So I've put together these tips that will make it easier for you to put the cover on, take it off and store it. When taking the cover off in the Spring I always get excited when I find a nice clean RV underneath. This is why I recommend giving your RV a quick wash before putting the cover on. Trust me, it’s worth it. 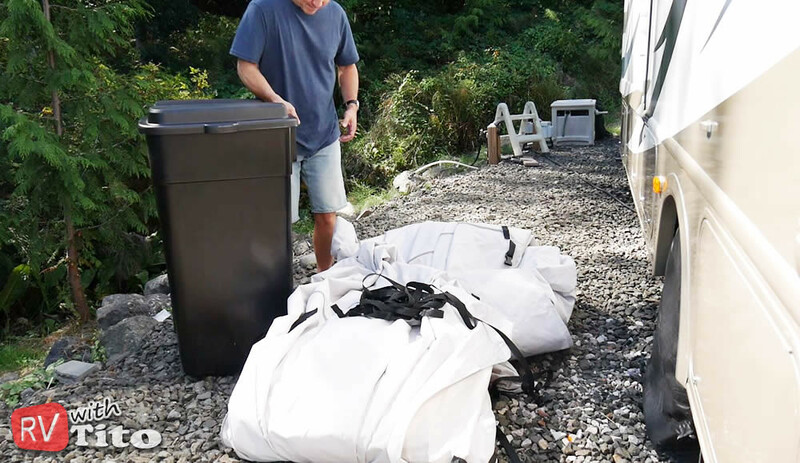 Hoisting your bulky RV cover up on the roof in its storage bag can be challenging, especially if you are not physically able to do so. There is an easier way. When it is time to remove the cover, simply reverse the process. Unclip the straps holding the cover onto your RV and gradually lower it back onto the ground. Once on the ground, you can roll it up and store it. Storing your RV cover back into its protective bag has always been one of the most frustrating things to do. When you get a new RV Cover, it comes folded perfectly and packed tightly in a nice little storage bag. Once you’ve removed it and used it though, folding the cover back up perfectly and packing it into that storage bag is nearly impossible. Frankly, I think it’s a waste of time so I’ve come up with a better approach. When selecting a cover for your RV I recommend going with a very heavy duty cover that will withstand the sun, rain and snow for as many years as possible. They will generally cost more but last years longer than the cheaper and extremely light weight covers. The RV cover on my RV has held up for five years now through cold winter as well as hot summer days with minimal wear. I believe I can probably get another couple years out of it. Cheaper covers I’ve used have had to be replaced after a single year. So spend the extra money and get the heavier duty one.